If you aren’t already listening to podcasts, now may be the time to start. For more than ten years, podcasts have been an easy way to consume a lot of information in little time. Experts believe there are currently more than 100,000 regularly updated podcasts on a variety of topics. Web design is no exception. Whether it’s a podcast dedicated to website architecture or one focused on branding through web design, you are sure to find something that helps grow your knowledge. It’s also easy to find the perfect one to fit into your life, as podcasts can vary in lengths and frequency. Listen to a 30-minute show on your daily commute, or settle in for a longer episode over an extended lunch. However you choose to listen, you are sure to find something you like. Below are three of the best podcasts for web designers of all types. Web design isn’t just about coding and creating. For many, it is also about making money. The Hacking UI Podcast understands this fact and thoroughly delivers. 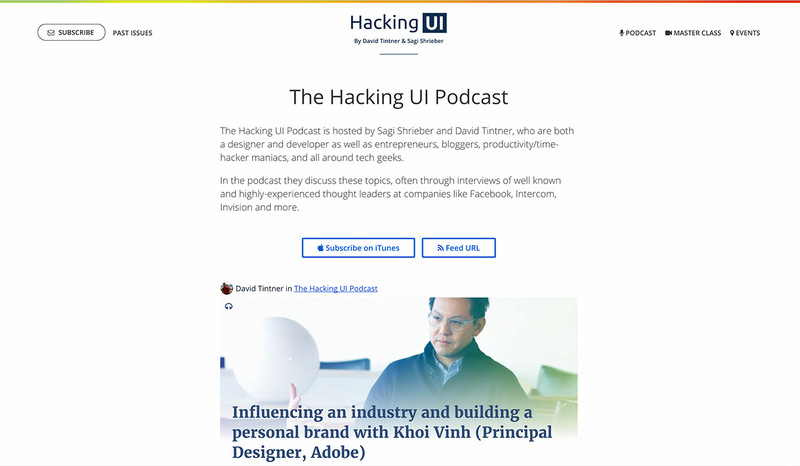 Hacking UI is an online community for creative entrepreneurs led by David Tintner and Sagi Shrieber. In addition to their podcast, their community also lists industry events, hosts a video “Master Class” and features a blog. There’s also a newsletter and Facebook Group. Staying true to the community theme of the site, Hacking UI Podcasts are led by industry experts. The podcast helps anyone learn from creative professionals associated with well-known digital companies such as Adobe, WordPress, and Typeform. The Hacking UI Podcast is much more than an audio broadcast. Each show includes a downloadable transcript, show sponsors (often with giveaways), and links to resources referenced in the show. You’ll gain much more than pure entertainment by subscribing to this podcast. The Hacking UI podcast is available on their website, or you can subscribe via iTunes or RSS. Sometimes you prefer to get down to the nuts and bolts of things. 5 by 5’s podcast, The Web Ahead does just that. 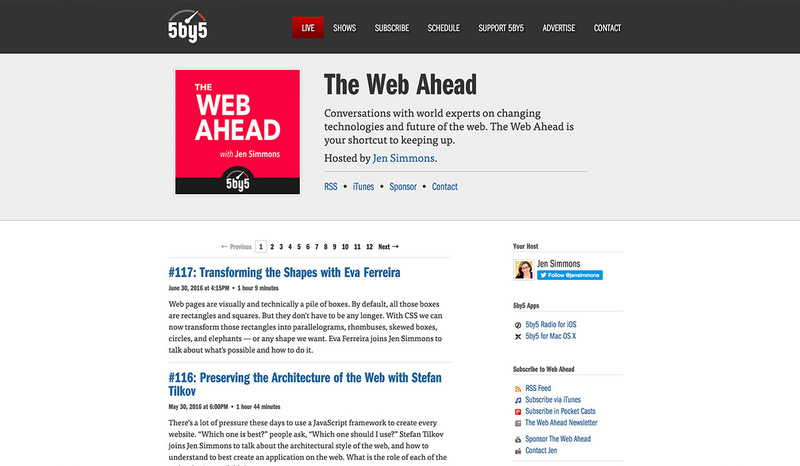 This podcast tackles the changing technologies of the web with a focus on what’s next. Listen in to stay ahead of the curve, or catch up on the latest trends. 5 by 5 is no stranger to podcasts for web designers and developers. First aired in 2006, the popular podcast became a production company in 2009. It now creates a variety of shows including podcasts and videos. The Web Ahead is one of many 5by5 shows that features over a hundred 90-minute episodes with industry experts. Hosted by Jen Simmons, a designer advocate at Mozilla, it won the coveted Net Award for Podcast of the Year in 2015. Listening to The Web Ahead has its perks. Many of the shows are sponsored and include handy giveaways. You can also download or embed MP3 files of their shows from their website for convenient offline listening or sharing. The Web Ahead podcast is available on their website, via the 5by5 app (for IOS), or you can subscribe via iTunes, Pocket Casts or RSS. Ever wish you had a responsive design expert to give you free advice? Problem solved. Responsive Web Design’s Podcast is the perfect audio reward for those who focus on creating highly accessible, user-friendly websites. The podcast is a creation of Karen McGrane and Ethan Marcotte, independent website responsiveness experts that have worked with organizations such as PayPal, Expedia, New York Life and Wells Fargo. 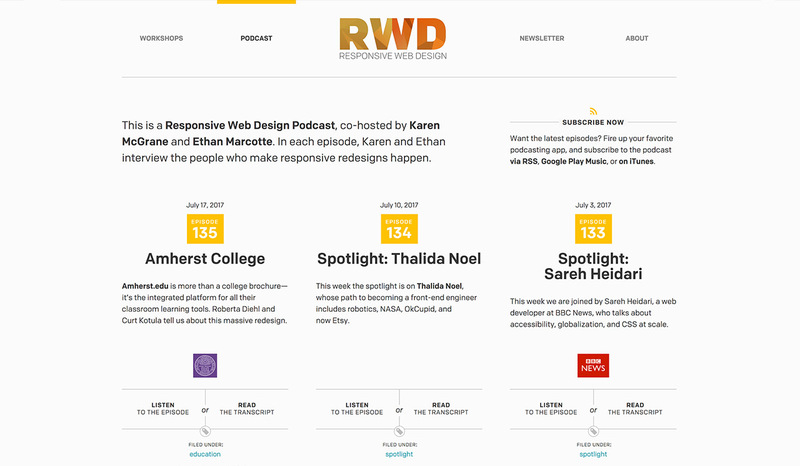 Responsive Web Design Podcast features over 100 episodes featuring interviews with various professionals involved in responsive web design and related fields. On it, you’ll hear from a variety of people, including strategists, animators, and developers; and learn about the many sides of responsive web design. The creators of the Responsive Web Design Podcast don’t just talk about easy to digest content; they also provide it. Their episodes are short and easy to access. You can download the mp3 and listen offline, or you can read the full interview transcripts on their website. Responsive Web Design Podcast is available on their website. You can also subscribe via iTunes, Google Play Music or RSS.